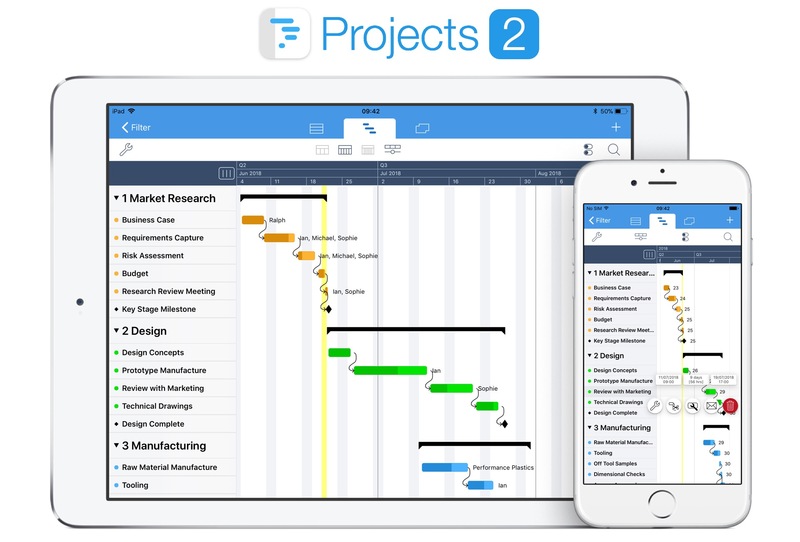 Projects 2 is a powerful project management application for planning, updating and reporting project progress. Task List, Gantt and Calendar views make it easy to visualize a project and make changes. Easy to use in the office with an iPad and when mobile using an iPhone. 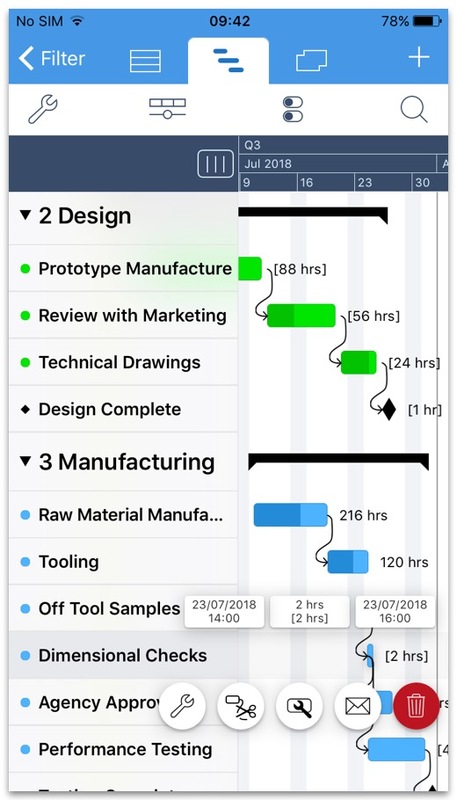 The Task view shows all the tasks within a project. Customize how task information is displayed with flexible filtering, sorting and display settings. Show/hide notes and completed tasks. Sort tasks manually or automatically by name or date. Filter by Flag, Milestone, Status, Phase, Resource. Find Tasks easily with keyword search. Add a To Do List to a task to track items required to complete the task. The To Do List viewer provides a convenient way to inspect To Do items and mark them as complete. Tap the checkbox to mark an item as complete and the task's percentage complete will update automatically. 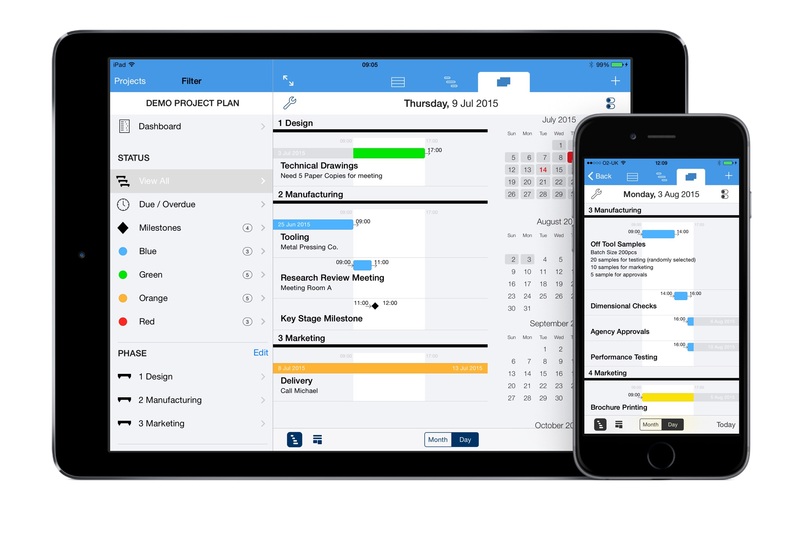 Filter the Task, Gantt and Calendar views to show tasks of interest. Filter by Flag, Milestone, Status, Phase, Resource. Re-order tasks. Move tasks between phases. Modify multiple tasks at a time to change status, phase and resource. Add a checklist of To Do items to task to keep track of key deliverables and tick them off as they are completed. 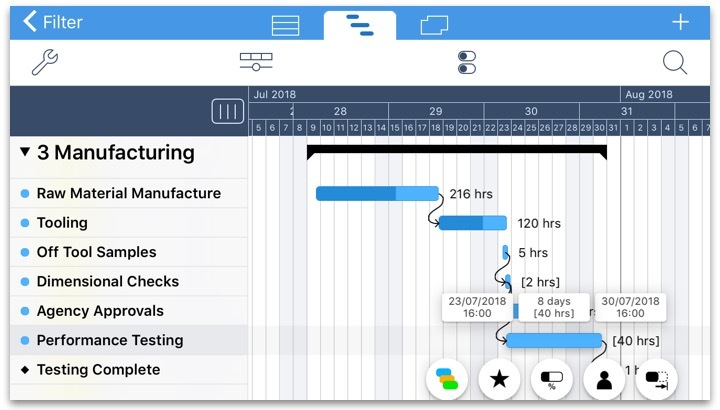 The Gantt chart helps visualize timescales and dependencies between tasks. 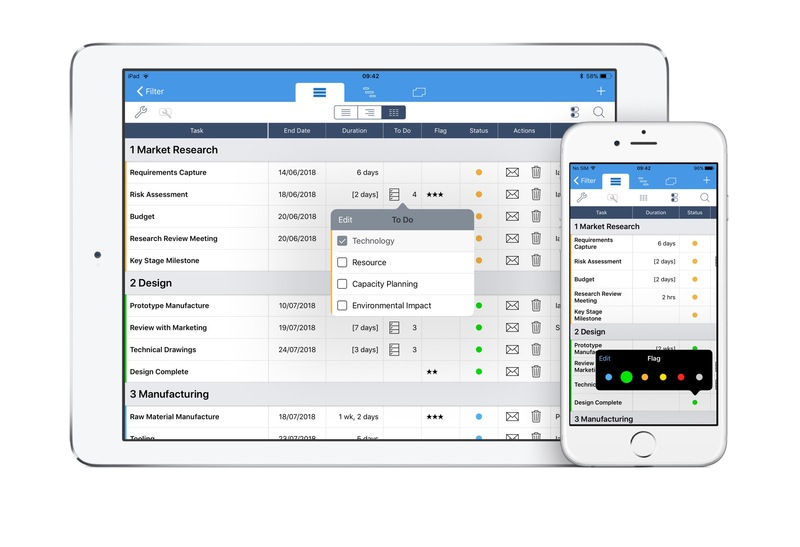 Filter, sort and search operations make it easy to manage complex projects. 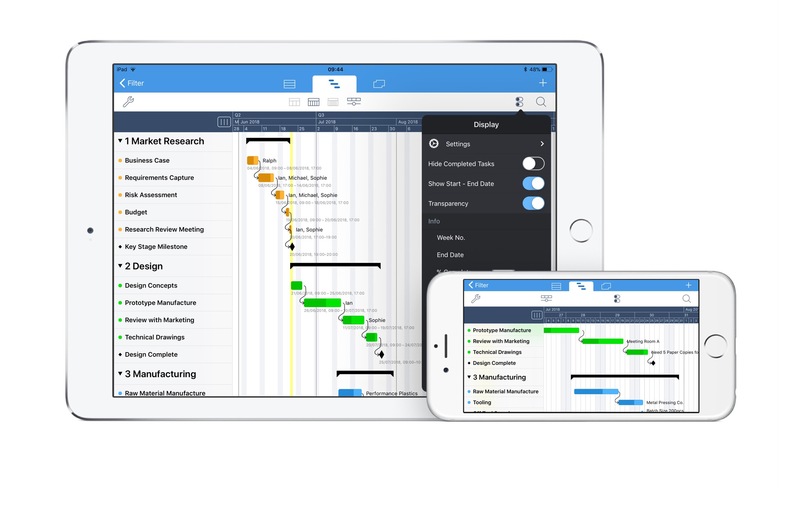 The Gantt chart looks great in portrait or landscape on both the iPad and iPhone. Adjust the time scale to show days, weeks, months and quarters. 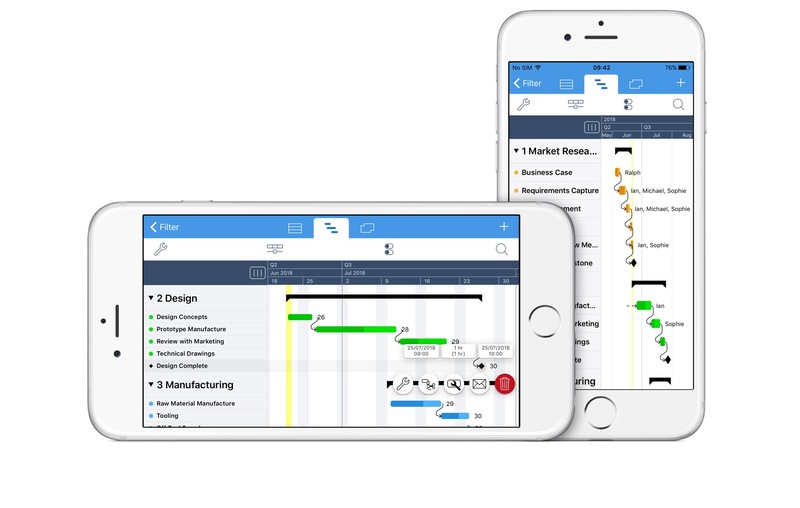 Fully optimized for touch input, the Gantt chart is easily manipulated with gestures and touch controls. 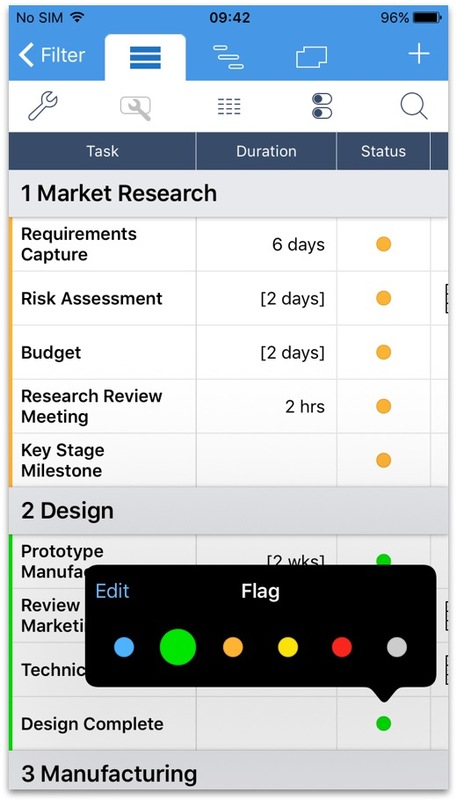 Drag with one finger to Pan and Scroll the view to see all tasks in a Project. Tap on the task name will scroll the task into view. Customize the appearance of the Gantt Chart. Tasks can be sorted manually or automatically by task name, start date or end date. Establish parent-child relationships and have the child tasks update automatically when a parent task changes. Find tasks easily with keyword search for tasks and notes. 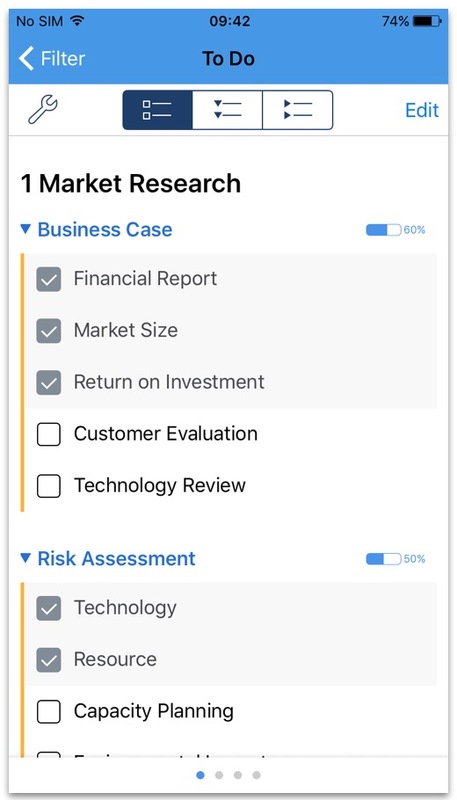 This will filter Task and Gantt views to show the tasks which meet the search criteria. 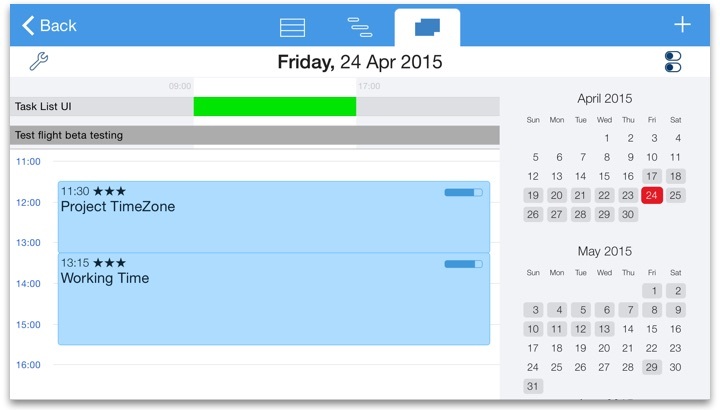 Projects 2 provides powerful tools to manage and visualize tasks in a familiar calendar format. Day and Month views can be explored effortlessly using swipe and drag gestures to change the date range. The calendar also benefits from powerful filter tools, including the option to show or hide completed tasks and notes. 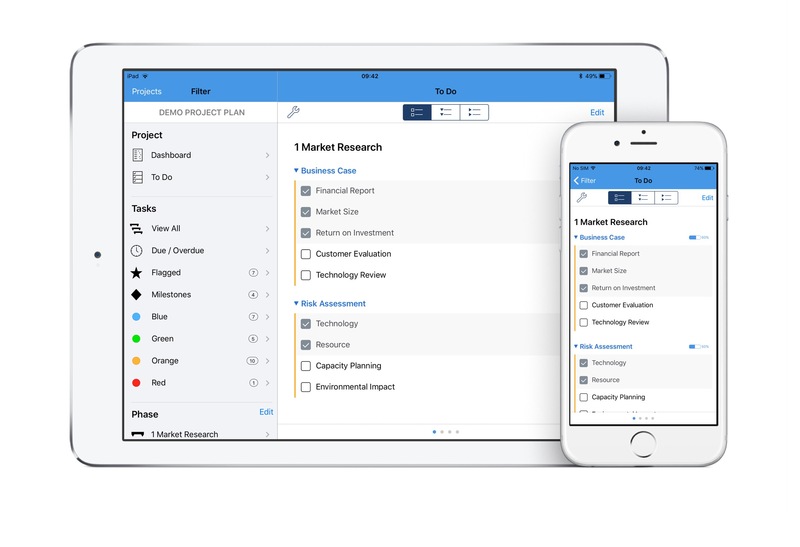 The day view lets you manage the smallest details of a project. 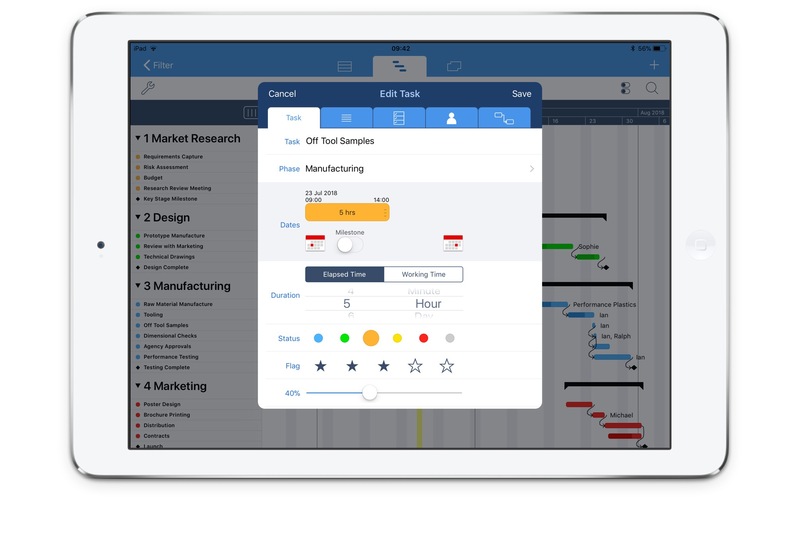 View tasks with a familiar time based view or with a Gantt based layout. 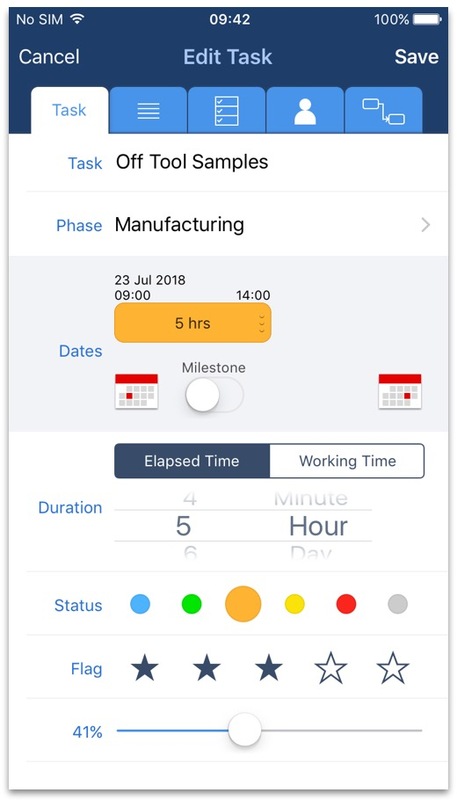 Interactive controls let you move a task and update the duration within the view. Select a date on the month calendar to select a specific date or swipe left/right to change one day at a time. 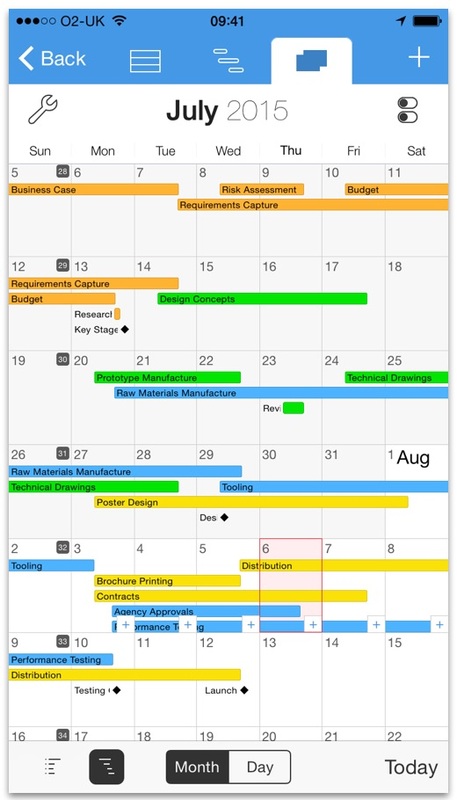 The Month view shows tasks in a Gantt style format overlaid on a calendar. 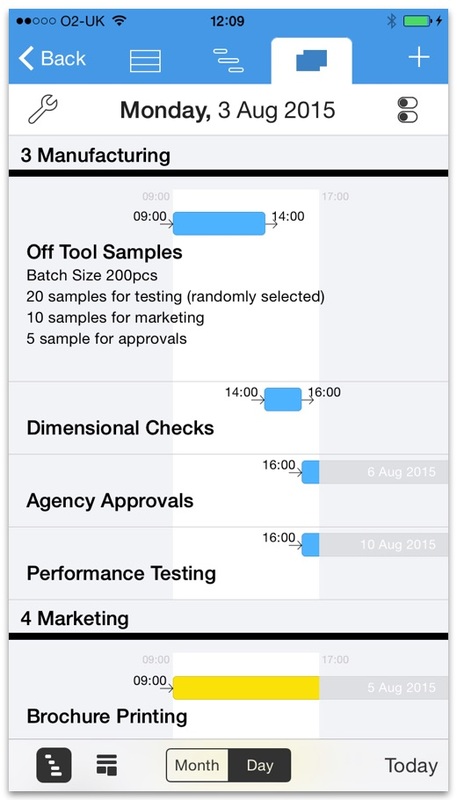 Adjust the height of the calendar cells to display more tasks when the schedule is busy. Display week numbers on the calendar and choose between a Gregorian or ISO week numbering system. A Dashboard gives a quick overview of your project showing key dates, task counts, status, task duration and completion. Tasks can be scheduled to occur during working time. 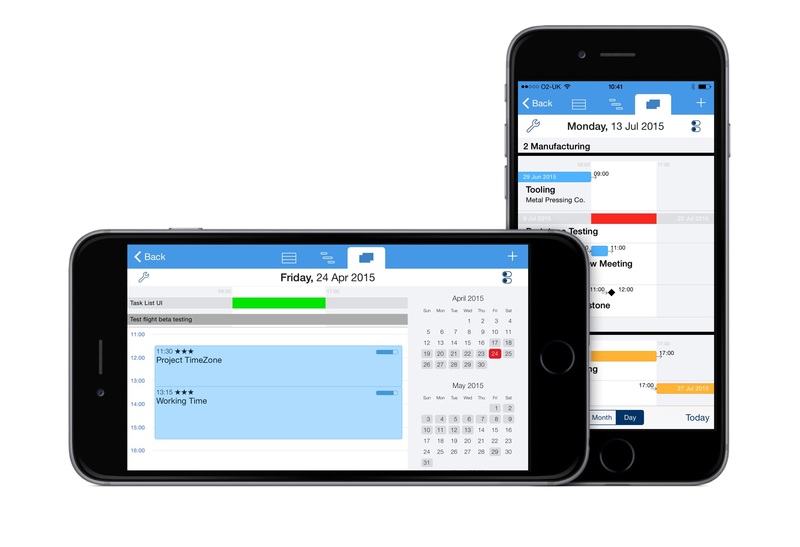 Adjust the working time calendar to specify working days and hours. Create and assign resources to tasks. Filter and search by resource in Task, Calendar and Gantt views. The Gantt report includes the familiar Gantt chart. The Task & Notes report includes tasks, notes, date, duration and percent complete information. The To Do List report includes tasks with To Do items. Each report can be customized and previewed on device to ensure the generated report is output as expected. Customization options include settings such as paper size and orientation, headers and footers and selection of Phases. A Cover Page can be added to the report which includes the Project Title, Revision and Project Manager. Reports can be shared by Email in PDF format or printed using a wireless printer with AirPrint. 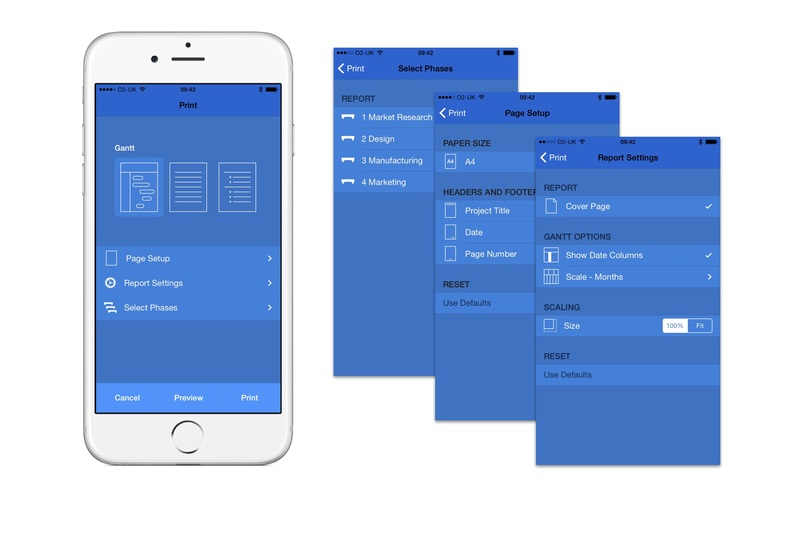 Projects is a universal app which means that it is specifically designed for the varying screen sizes of the iPhone and iPad. Purchase Projects 2 on one device, and use it on all other devices that you own. iCloud makes sure you always have the latest versions of your Projects on whatever device you are using. 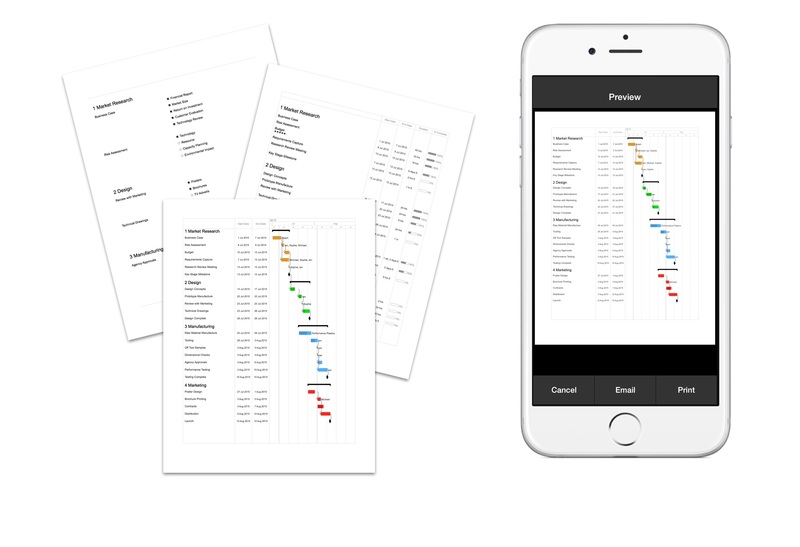 AirPrint makes it simple to print reports right from your iPhone or iPod touch. A few taps is all it takes to go from viewing it onscreen to holding a printed copy.